There has been a Summit Relocation to a hill that now appears in the following lists; 30-99m Twmpau and Y Trechol – The Dominant Hills of Wales, with the hill’s height, drop, dominance and status confirmed by analysis conducted by Aled Williams of data produced via LIDAR. The name of the hill is Bryn y Gwynt and this was derived from local enquiry and historical mapping (see Significant Name Changes) and it is situated in the Moelwynion range of hills and is placed in the Region of North Wales (Region A, Sub-Region A1), and is positioned with the A 4085 road to its north-east and has the Welsh Highland Railway to its immediate west and overlooks the Afon Glaslyn also to its west, and has the village of Beddgelert to its north north-west and the town of Porthmadog to its south south-west. The hill is a part of Coed Hafod y Llyn, and as this name implies its summit is placed in woodland which is deciduous, and as the summit is not a part of designated open access land permission to visit should be sought, however paths are indicated on the map to the north, east and south of this hill’s summit and therefore gaining access to its lower slopes has probably been accepted for many years. Prior to analysis of data produced via LIDAR this hill was listed in the Hills to be surveyed sub list that accompanied the Welsh P30 lists published on Geoff Crowder’s v-g.me website. When these sub lists were standardised and also drop values added, this hill was listed with c 29m of drop based on the 56m spot height that appears on the Ordnance Survey 1:25,000 Explorer map at SH 59881 44828 and an estimated bwlch height of c 27m based on contouring at 10m intervals and between 20m – 30m, with the caveat that the 27m spot height that appears on a road at SH 60168 45293 on the Ordnance Survey Interactive Coverage Map hosted on the Geograph website is not positioned at the critical bwlch. 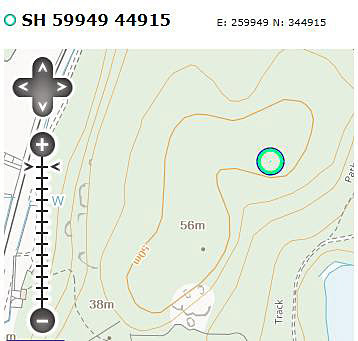 The summit height produced by data via LIDAR analysis is 58.2m and is positioned at SH 59949 44915, this position is not given a spot height on Ordnance Survey maps and is approximately 80 metres north-eastward from the previously listed summit position.